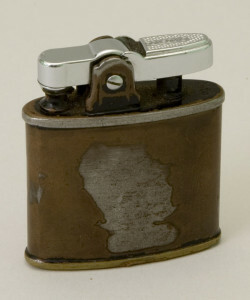 Army-issued cigarette lighter carried by Gen. Eisenhower in World War II. Courtesy Eisenhower National Historic Site. Gettysburg, PA (March 6, 2018) – The Gettysburg Foundation and Eisenhower National Historic Site are pleased to announce the debut of an exciting new exhibit on March 8 featuring a variety of objects from the Eisenhower National Historic Site’s museum collection. The exhibit, titled Eisenhower’s Leadership from Camp Colt to D-Day, provides a look at two pivotal events in the military career of Dwight David Eisenhower. During the First World War, Captain Eisenhower arrived in Gettysburg in March 1918 to organize and lead Camp Colt, a training ground for the Army’s new Tank Corps. Set upon the hallowed Gettysburg battlefield, Eisenhower’s men lacked the proper equipment for training and struggled against the Spanish flu. Eisenhower overcame these difficulties, and at Camp Colt, a leader emerged. Twenty-six years later, General Eisenhower found himself in a position of much greater responsibility. On June 6, 1944, as the supreme commander of the Allied Expeditionary Force, Eisenhower oversaw the invasion of Nazi-occupied France via the beaches of Normandy. The largest amphibious landing in history was a success and paved the way for the Allied liberation of Western Europe. Eisenhower’s leadership shone again in the Second World War. Highlights of the Exhibit Spotlight include equipment issued to an officer at Camp Colt who volunteered for the Tank Corps, “dog tags” of an enlisted man at the camp that survived the Spanish flu pandemic, the Army-issued cigarette lighter carried by General Eisenhower throughout World War II, and a piece of barbed wire from the German defenses at Point du Hoc. Free and open to the public, the exhibit runs through 2018, and is the newest display of artifacts within this specific area of the Museum and Visitor Center. The Exhibit Spotlight gallery annually features a new theme and rotation of artifacts that connect soldiers, civilians and generals to places on the Gettysburg battlefield. Visitors have the opportunity to follow the journey of the person featured in the exhibit through their Gettysburg experience—watching the story unfold as they explore the connections found in both the Museum and Visitor Center and on the battlefield. Planning is underway for future Eisenhower exhibits, made possible by the Tawani Foundation/Pritzker Military Foundation. The Gettysburg Foundation is a 501 (c)(3) non-profit philanthropic, educational organization operating in partnership with the National Park Service to preserve Gettysburg National Military Park and the Eisenhower National Historic Site, and to educate the public about their significance. The Foundation has a broad preservation mission that includes land, monument and artifact preservation and battlefield rehabilitation—all in support of the National Park Service’s goals at Gettysburg. www.gettysburgfoundation.org. The Eisenhower National Historic Site preserves and interprets the home and farms of the Eisenhower family as a fitting and enduring memorial to the life, work, and times of General Dwight David Eisenhower, 34th president of the United States, and to the events of far-reaching importance that occurred on the property. www.nps.gov/eise. Posted in Uncategorized on March 9, 2018 by Gettysburg Battlefield Tours.